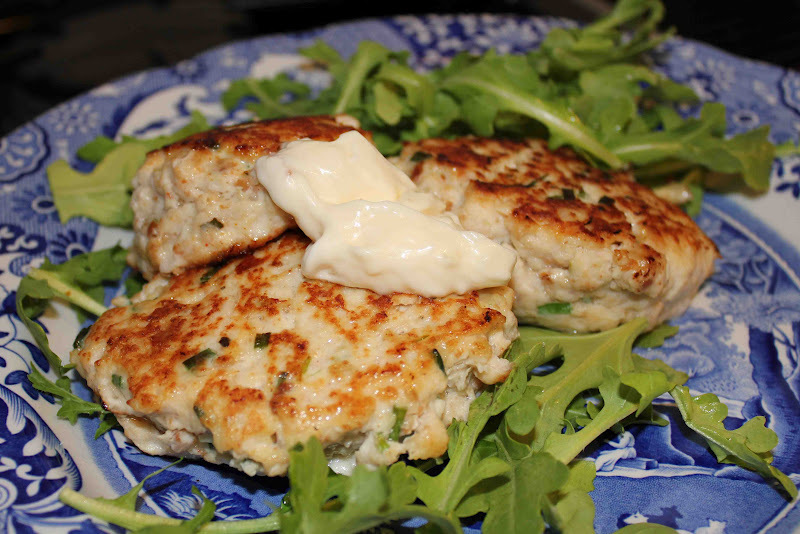 If you like crab cakes, you’ll LOVE these spicy chicken cakes from Cooking Light! I’m not saying they taste like crab cakes, but they sure do look like them. The cakes were super easy to make, inexpensive (especially when compared to crab meat), and my husband and I both gave them two thumbs up. Unlike the name, I don’t recall the chicken cakes being too spicy. They were well seasoned, flavorful, and the aioli sauce brought an “elegance” to the dish that gave me the feeling I was eating in a 5-star steak and seafood restaurant. Serve the chicken cakes over a bed of arugula, top with a dollop of aioli, and you’ve got yourself a healthy, protein-packed meal that is under 300 calories and less than 10 grams of fat. This is truly one of my new “favorites”. Enjoy! 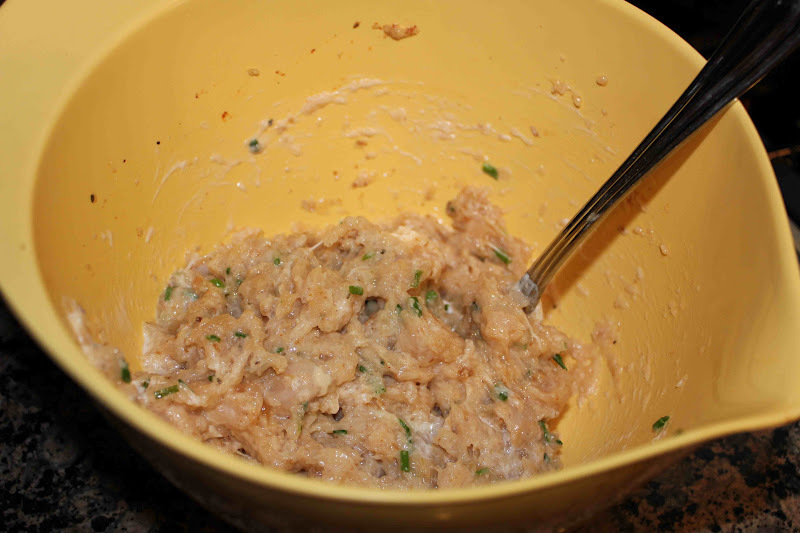 Combine chicken mixture in a medium-sized bowl. Over medium heat, cook chicken patties for 7 minutes. Flip and cook for another 7 minutes, or until done. Serve over a bed of arugula and a dollop of aioli. 1. To prepare cakes, place bread in a food processor; pulse 10 times or until coarse crumbs measure 1 cup (discard remaining breadcrumbs). Set breadcrumbs aside. 2. Place chicken in food processor; pulse until ground. Combine chicken, chives, 3 tablespoons mayonnaise, seasoning, 1/4 teaspoon salt, egg whites and breadcrumbs in a medium bowl; mix well (mixture will be wet). Divide mixture into 8 equal portions, shaping each into 1/2-inch-thick patty. 3. Heat oil in a large nonstick skillet over medium heat. 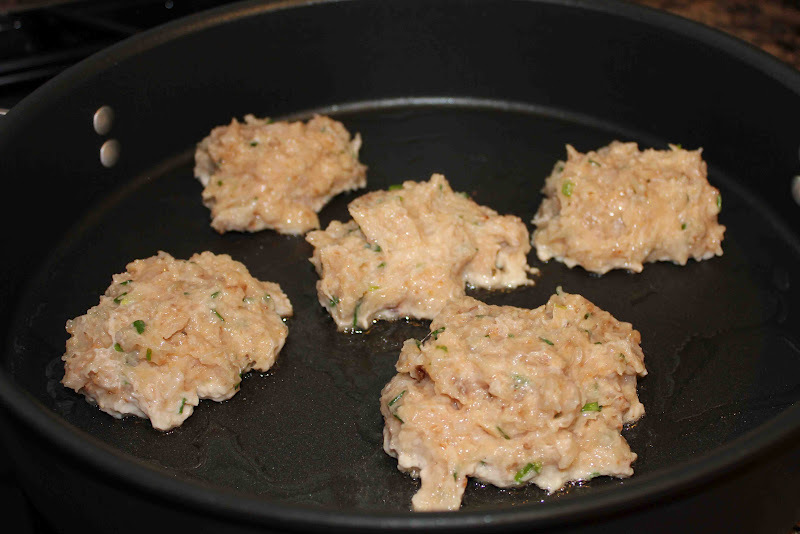 Add patties; cook 7 minutes on each side or until done. 4. To prepare aioli, combine 2 tablespoons mayonnaise and remaining ingredients in a small bowl. Serve with cakes. 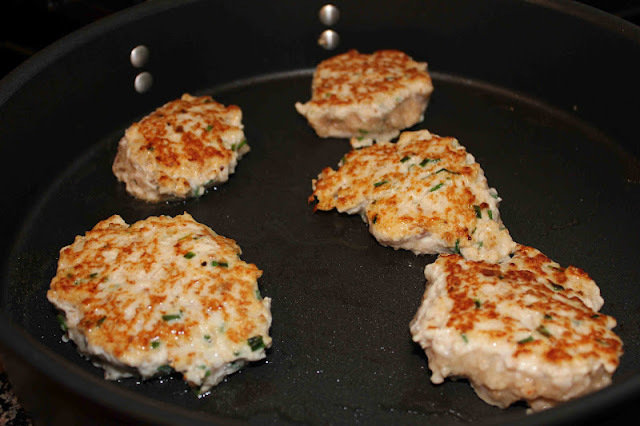 4 Responses to "Spicy Chicken Cakes"
This is great party time recipe. Thanks for sharing this recipe. I love the idea of these chicken cakes! Perfect for an exciting quickie dinner 😉 thanks for sharing!